Isn’t it lovely? 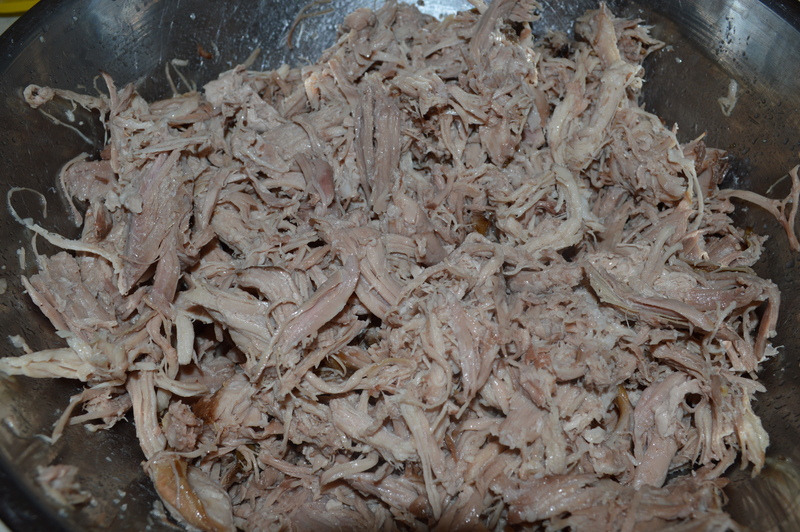 You can cook the meat with 1 cup of water in a pressure cooker for 35 to 40 minutes or in a crock pot on low for about 10 hours, but I like the results from the oven. And just look and those amazing juices? We’ll be using these later so just set them aside. Let the meat cool some and remove the fat and bones. Shred. Heat the oil in a dutch oven and add the onion and chilis and sauté for a few minutes. I got so caught up in what I was doing that I forgot to take pictures of the chilis…and the garlic. Add the garlic and continue cooking for another minute before adding the green chili salsa. Stir that all together, then stir in the flour along with the salt and cumin. Cook another minute over medium-low heat. Add the juices that you set aside. 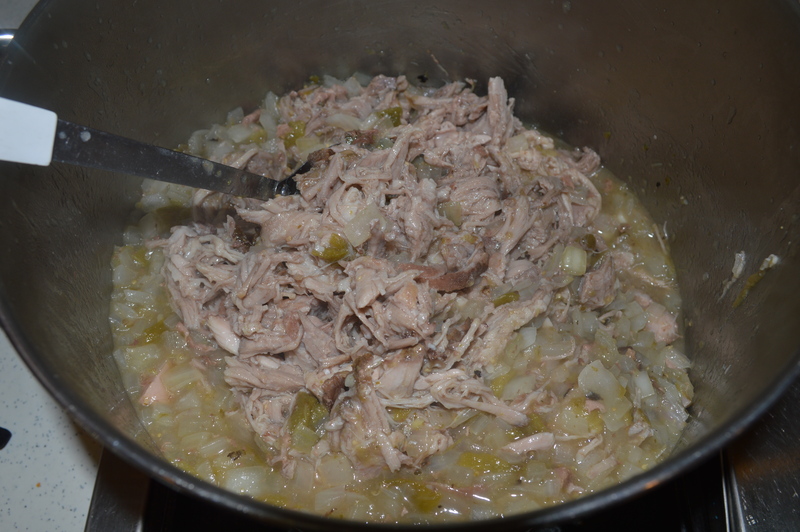 Add the shredded meat and let cook until thick, probably another 5 or 10 minutes. Just look at that lovely meat! Now you can do whatever you want with it. Make chimichangas, green chili burros, enchiladas, tacos. It’s also great in scrambled eggs. Preheat oven to 200º F. Place roast(s) in large roasting pan or a Dutch oven. Do not add salt or water. Cover with a tight lid and roast about 12 hours, until well done. 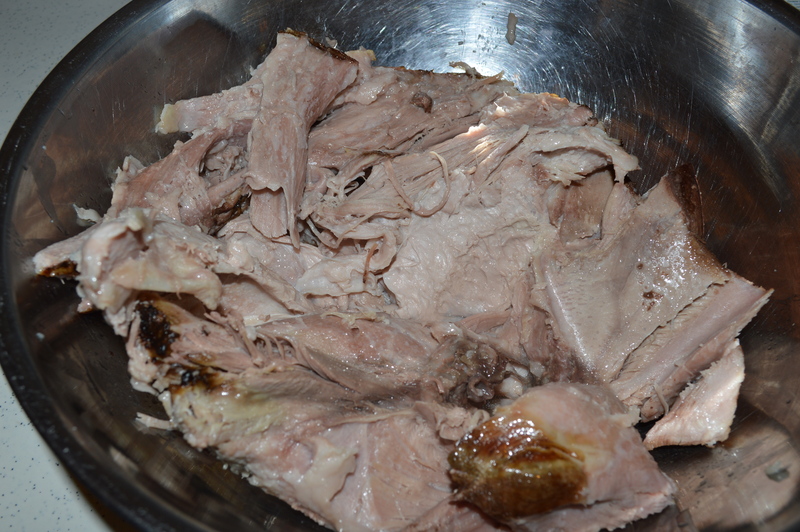 Remove meat to a large bowl, reserving juices. Let meat cool some, then remove fat and bones. Shred meat, and set aside. Heat oil in a dutch oven or very large skillet. 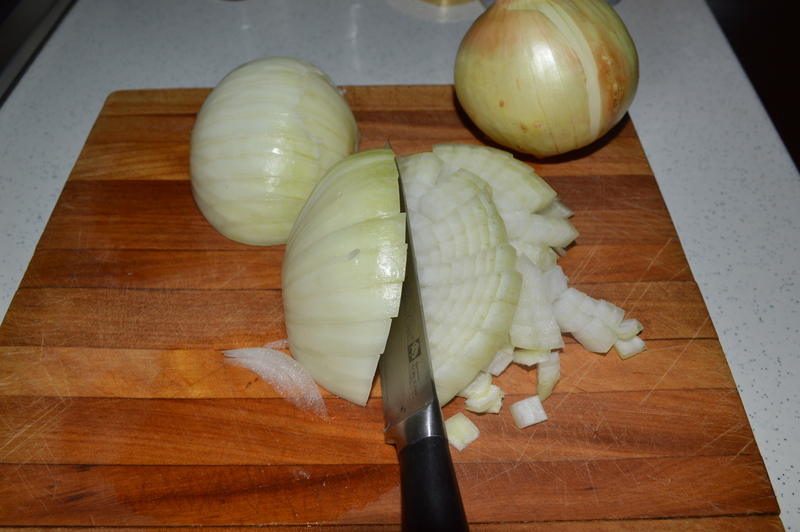 Add onions and green chilis. Sauté for a few minutes, then add garlic and sauté for another minute. Add green chili salsa and stir. Add flour, salt and cumin. Cook for a minute or two over medium-low heat. 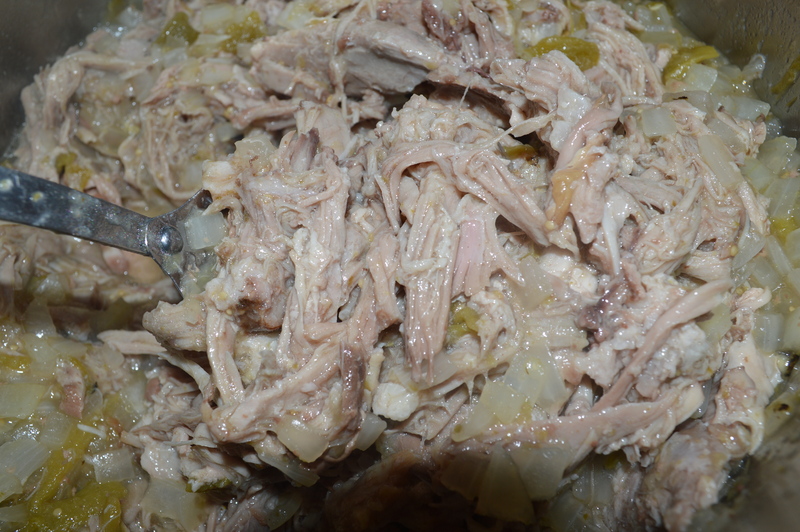 Stir in reserved meat juices and shredded meat. Cook 5 to 10 minutes or until thick. Last summer my twins spent 2 weeks with their best friend up in Idaho. While there, her mom made a dish that has had my girls longing for ever since. She sent me the recipe over Christmas and I made it last night. 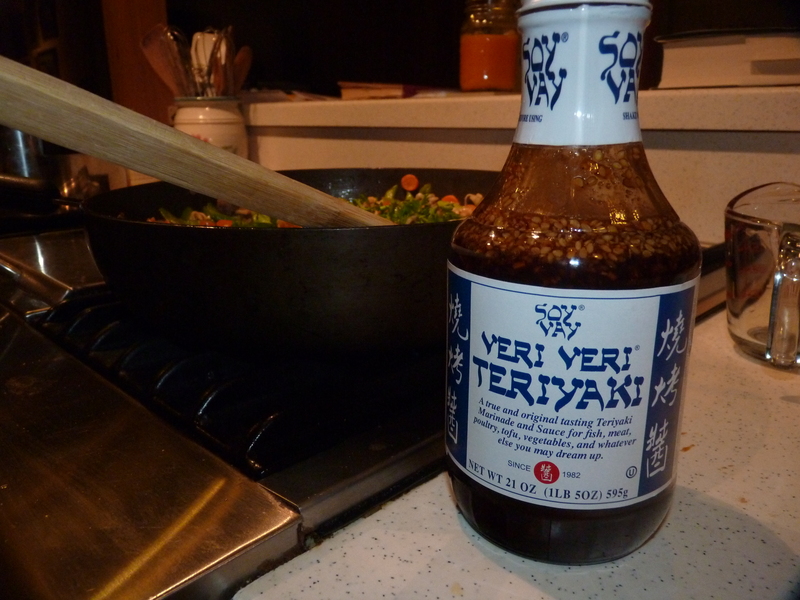 My favorite teriyaki sauce of all time! 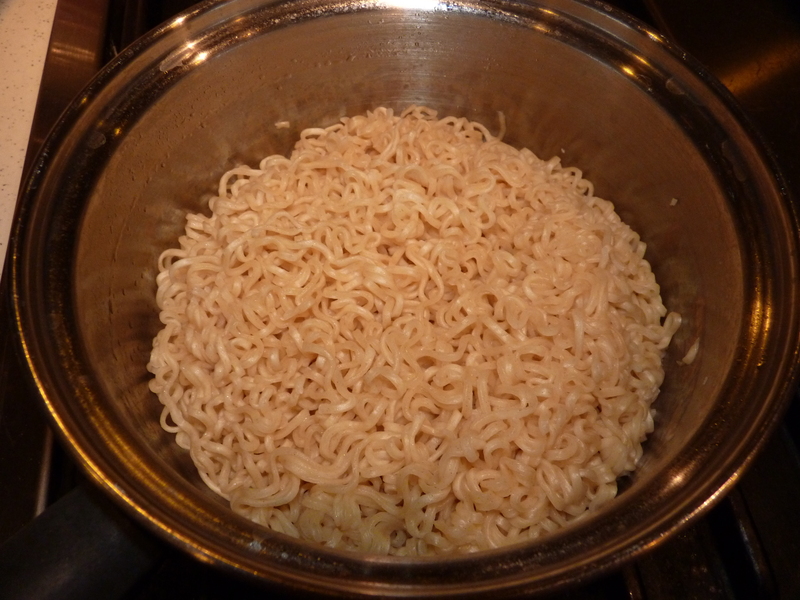 Cook ramen noodles according to package directions, except drain the noodles nad reserve the seasoning packages. Meanwhile, trim any separable fat from meat. If using steak, cut into bite-size strips; set aside. 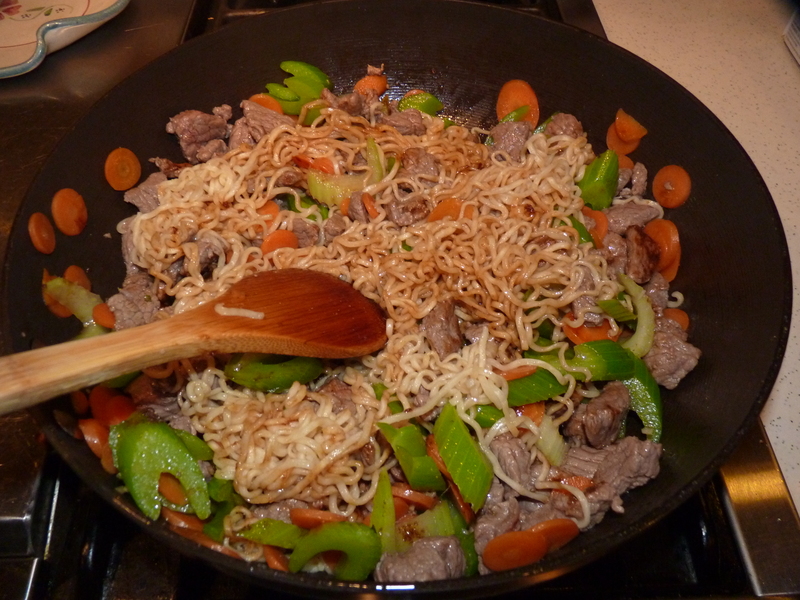 Preheat a wok or large skillet over medium-high heat. Add oil (you can add more oil as necessary during cooking.) 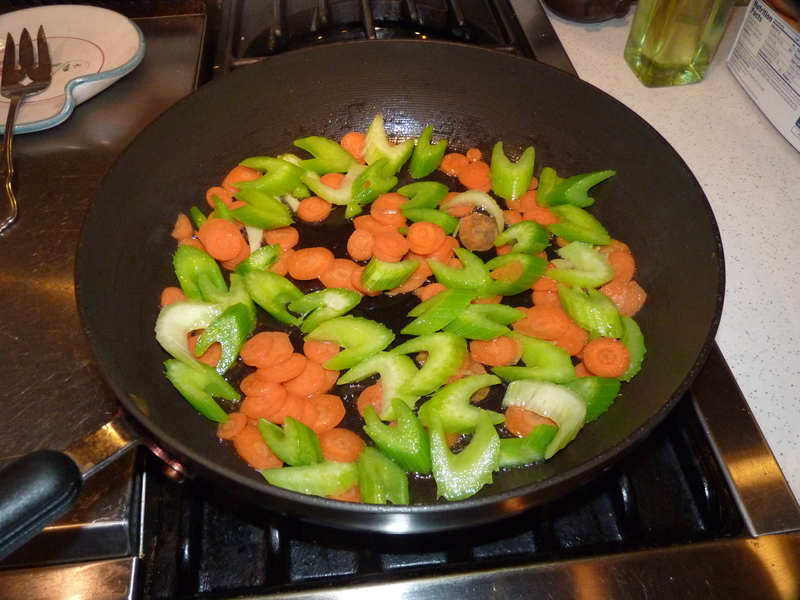 Add carrot and celery and stir-fry for 2 to 3 minutes or until crisp-tender. Remove to a bowl to be added back in later. Add beef to the hot pan. 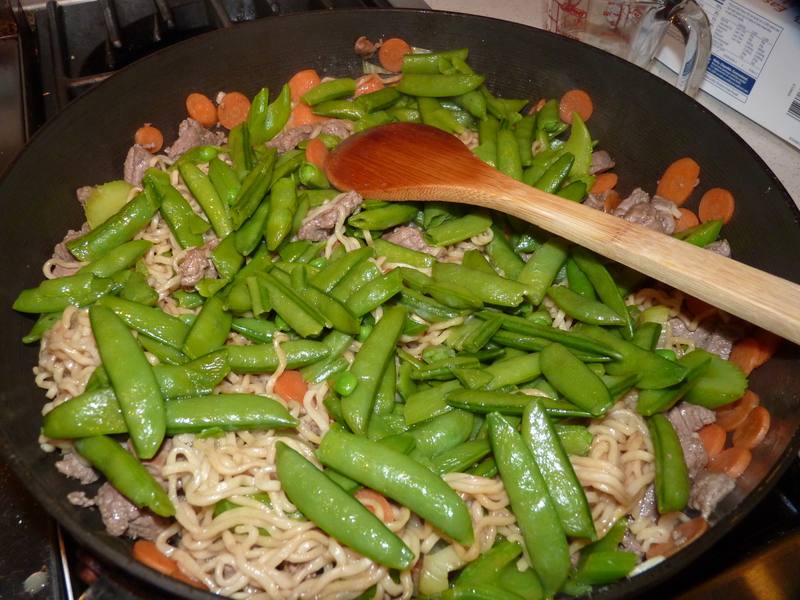 Stir-fry for 2 to 3 minutes or to desired doneness. Don’t overcook or could get tough. Return carrot and celery to the pan. Stir in noodles, reserved seasoning packages, pea pods, water parsley, teriyaki sauce, ginger, and, if desired, crushed red pepper. Cook over medium heat until heated through, stirring occasionally. A couple of nights ago my husband and I were watching the Food Network show ‘The Best Thing I Ever Ate Combos’. One of the featured combos was biscuits and gravy. My husband really wanted it for breakfast the next morning so I obliged. I love this dish because it is so easy and it’s such comfort food. You can make it reasonably good for you too. I used a little bit of whole wheat flour in both the biscuits and the gravy. I like to get some fiber and whole grains in things where I can. My family had no idea. I also use 2% milk in the gravy to cut down on the fat. Believe me, there is no need for cream! The biscuit recipe I got from my favorite go-to cookbook that I’ve had since college. It is called Easy Basics for Good Cooking from Sunset. I love it! The only thing I changed was that I used ½ cup of whole wheat flour. I’m putting in the original recipe, though. If you all want to substitute some whole wheat you’ll have to remember on your own. Preheat oven to 450º F. In a bowl, sift together dry ingredients. Using a pastry blender, cut in the shortening until it is like coarse cornmeal. Make a well in the center and pour in milk all at once. stir with a fork until dough cleans sides of bowl. With your hands, gather dough into a ball; turn out onto a lightly floured board. Knead about 10 times (dough will feel light and soft, but not sticky). Roll out our pat dough into a ½ -inch-thick circle. Using a floured 2-inch cutter (I use a can), cut biscuit rounds as close together as possible, since rerolling toughens dough. Fit leftover bits of dough together, pat smooth and cut. Place biscuits close together (for soft sides) or 1 inch apart (for crispy sides) on an ungreased baking sheet. Bake for 15 to 20 minutes or until tops are lightly browned. Quantity will vary depending on the size of you cutter. My cutter was a little bit bigger than 2″ and I got 8 biscuits. Cook sausage in a skillet over medium-low heat, stirring and breaking up. With a slotted spoon, remove the browned, crumbled sausage to a paper towel-lined plate. Add the shortening to the drippings in the skillet. Add flour, stirring until blended and bubbling. 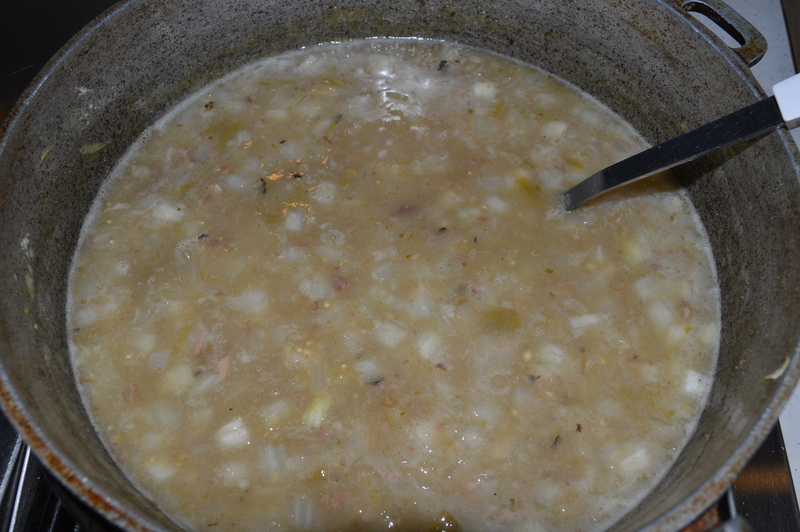 Gradually add the milk; continue stirring and cooking until thickened and bubbly. Add the sausage. If too thick, add a little more milk. Add salt and pepper to taste. I followed a recipe from About.com, but doubled it. You can find the original recipe here. We made very simple scrambled eggs for this dish. They were seasoned with salt and pepper only. 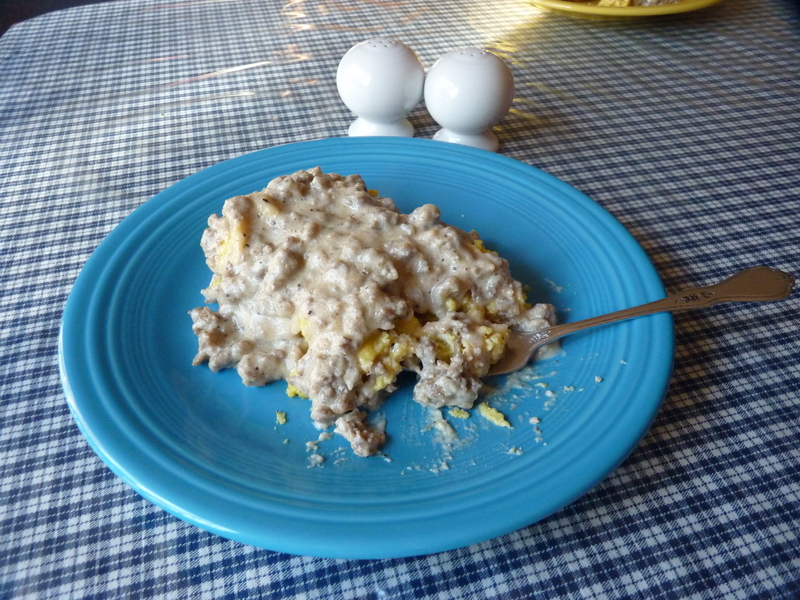 To serve: open a biscuit, top with eggs and smother with sausage gravy. It is delicious and deceivingly filling. I have been so obsessed with Pinterest since discovering it about 2 months ago that I have trouble tearing myself away from it. At least it does have benefits (unlike some other sites). I have actually made several things I’ve seen on there – like hand cream, laundry detergent, sugar scrubs, and some beautiful decorations for my daughters’ bedroom. And recipes. I just discovered a craft site from a pin that I love! It isn’t so much a craft site in and of itself, but it is a compilation of pictures of crafts which link you to the sites which give you the instructions (much like Pinterest). This site is called craftgawker. Here is a link: http://craftgawker.com/ . I really do like to make things from scratch. 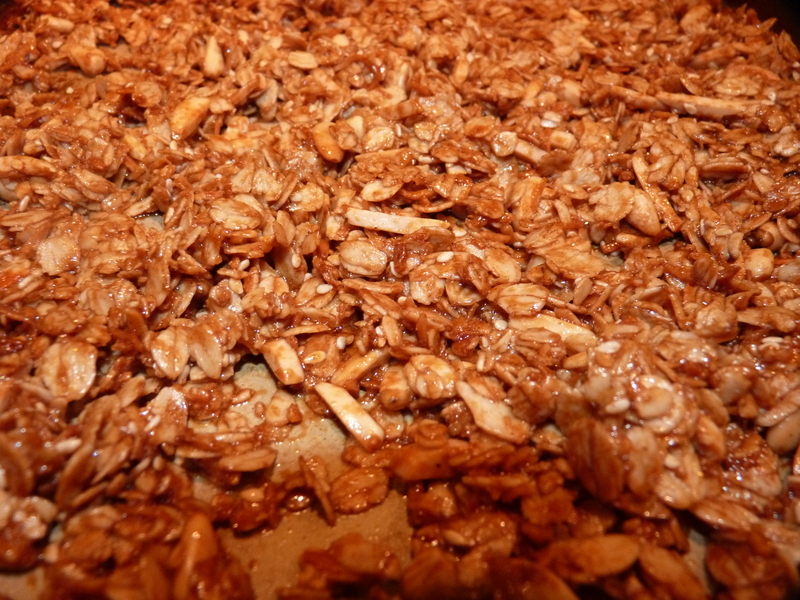 I have only made granola a couple of times, though. I don’t know why I don’t make it more often. 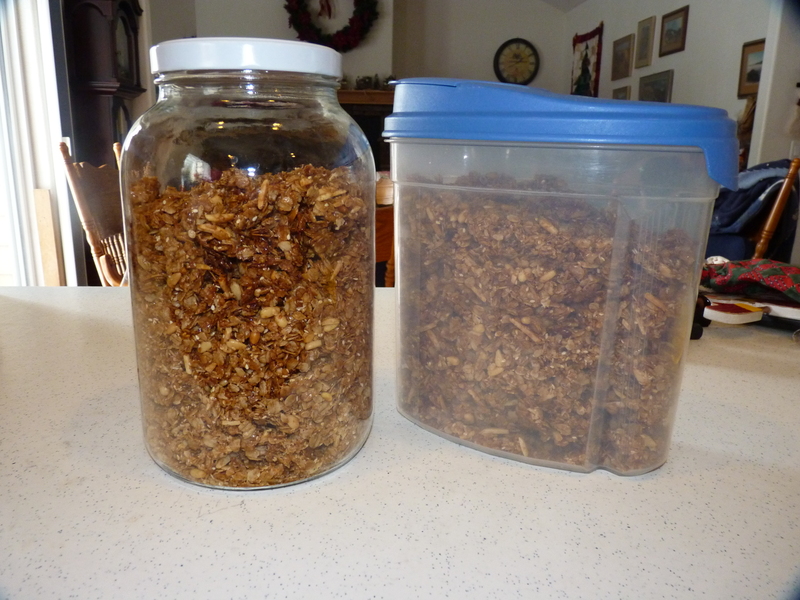 Maybe it’s because when my family finds out there is homemade granola in the house, 10 cups of it disappears in about 3 days. Okay, maybe that is a slight exageration…..but then again, maybe not. It is an easy process and really does cost a lot less than buying it. Plus, you have the added advantage of being able to put whatever you want into it. 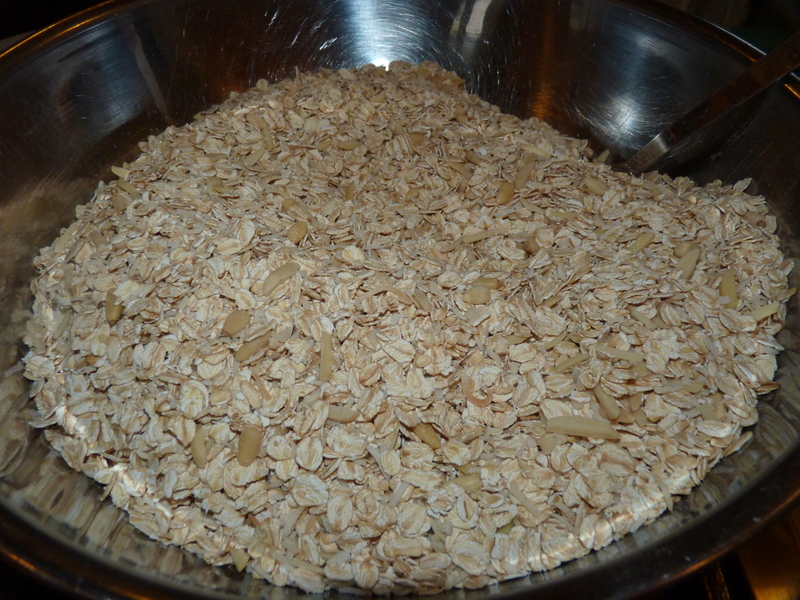 I started with 10 cups of rolled oats. From there you can add whatever you want. 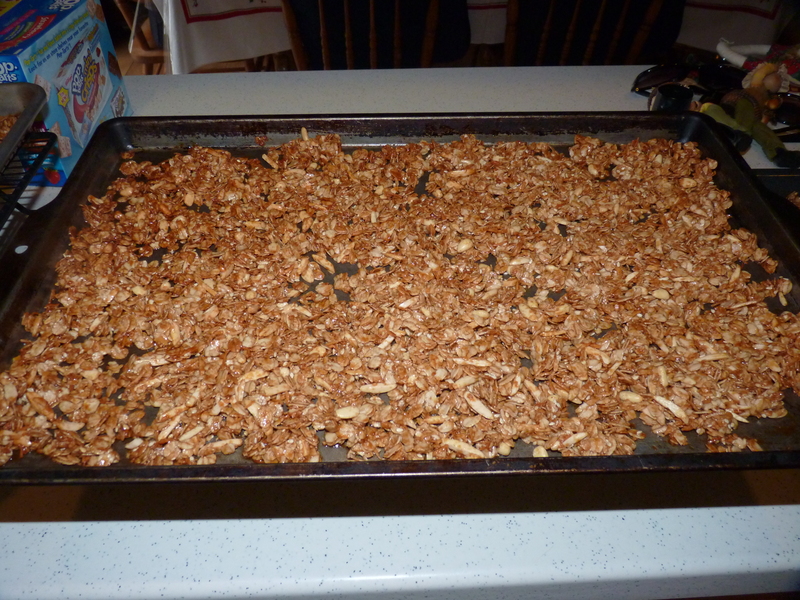 I just put in what I had on hand: slivered almonds, pine nuts, sesame seeds, and unsweetened shredded coconut. Stir it all up well in a large bowl. Granola is sweet. There is no getting around this, but that’s why we like it so much. I wanted to use several different sweeteners just to give it some depth of flavor. I used honey, molasses and both dark and light brown sugars. I also used some grade B maple syrup that I had left over from another recipe. There wasn’t enough to really give it a maple flavor but it was a good way to use it up. I think putting more in sometime would be excellent, though. For the oil, you can use whatever you want: canola, vegetable or safflower will do. I used coconut, though, because I love the flavor and I believe it to be better for us. 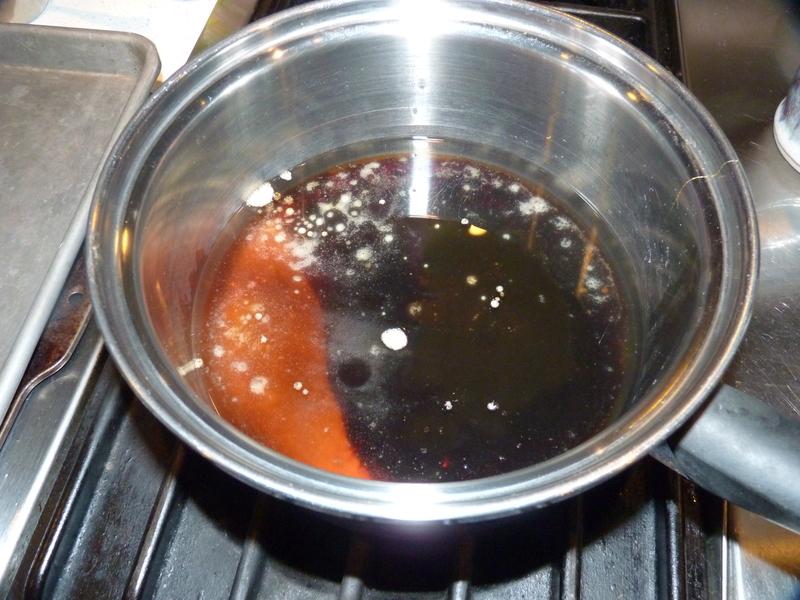 Heat the sweeteners and oil on the stove. Add salt, cinnamon and vanilla. Heat this long enough that the sugar dissolves but don’t boil it. Just a note here, this is not a good time to stir absent mindedly while perusing Facebook on your phone. I almost made taffy. Pour the syrup over the dry ingredients and stir it up really, really well. You don’t want any hidden dry areas. Spread this mixture out evenly onto 5 cookie sheets with sides. I found the ones that worked the best were a flexible jellyroll pan and a stoneware pan. The thinner you can spread it the easier it will be to get off the pan when it’s done. I baked it for 20 minutes, then stirred it all up and baked for another 12 minutes – 2 to allow the oven to get back to temperature and then 10 at temp. 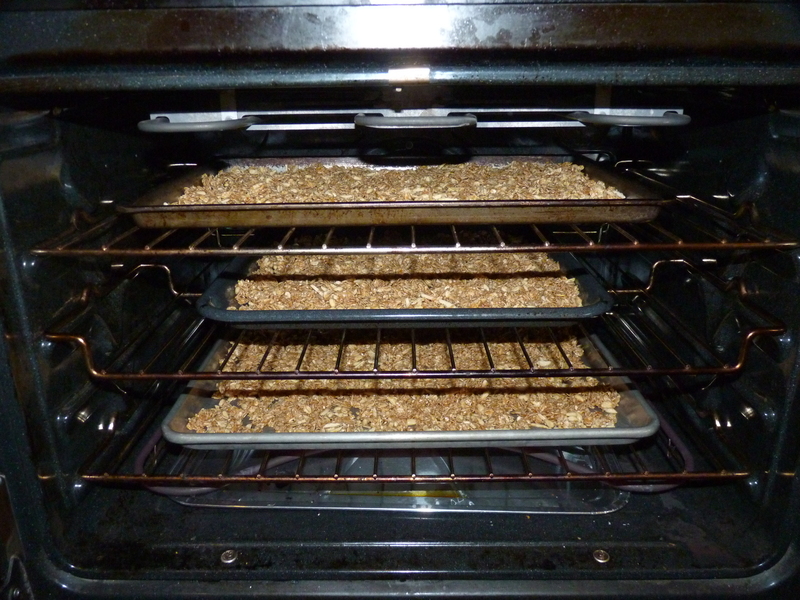 Allow the granola to cool completely! 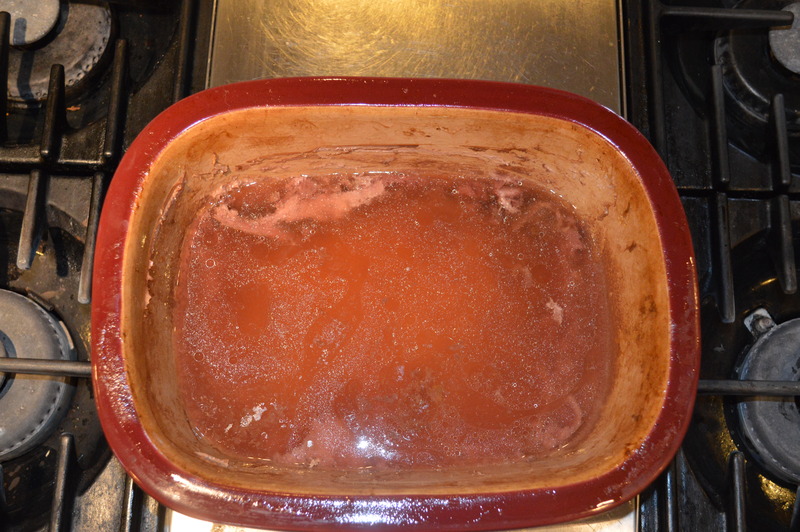 If you put it in airtight containers while it is still warm at all, it will get soggy and might even mold. It has been a ridiculously long time since my last post. I have no excuse. A couple of weeks ago I ran across a fabulous biscuit recipe that is the easiest I’ve ever made. It is a great base recipe that can then be made sweeter or more savory with various stir-ins depending on what you’re serving them with. I cannot tell you how much I love this recipe because of its versatility and ease. Here is the base recipe. I will include the 2 variations I’ve made at the end. *You can substitute sour milk or 1 cup 3 T. of sweet whole milk mixed with 1 T. of white vinegar. Preheat oven to 425º F. Spray a standard muffin pan with cooking spray. Cut the butter into tablespoon sized pieces into the bowl of flour. Using your (hopefully clean) hands work the butter into the flour, schmooshing the butter between your fingers and mixing with the flour until the mixture resembles a coarse meal. If you are stirring in any add-ins, now would be the time to do it. Make a well in the center and pour in the buttermilk. Using a wooden spoon, gently mix the flour into the buttermilk until the flour is moistened but being careful not to over mix. The dough will be quite sticky. Working quickly, make “balls” of dough (really they’re more like globs) with your hands and place them in the wells of the muffin tin. It is really gooey – avoid the temptation of over handling the dough. Just loosely place it in the wells. If you need to go back and add more to some to use all the dough up then just place the extra on top of the already placed dough. It will all back together just fine. Bake 12-13 minutes (15-17 minutes in high altitude) until tops are browned. Remove from oven and let cool for a couple of minutes before removing to a wire rack to cool for a few more minutes. Follow base recipe, but change sugar to approximately 1/3 C. and add ¾ C. dried cranberries (like Craisins) and the fresh zest of one orange. Follow base recipe, using ¼ C. sugar and adding 1 C. shredded cheddar cheese. This morning I got up to a house that was 59º F. That was on the inside of the house. It was 4º F. on the outside. Comparatively the house was warm, but it was still freezing to us. We had the heat on. We had a space heater running. We had a fire burning in the fireplace. We were still cold. What to do. Bake, of course! We desperately needed the oven going too. 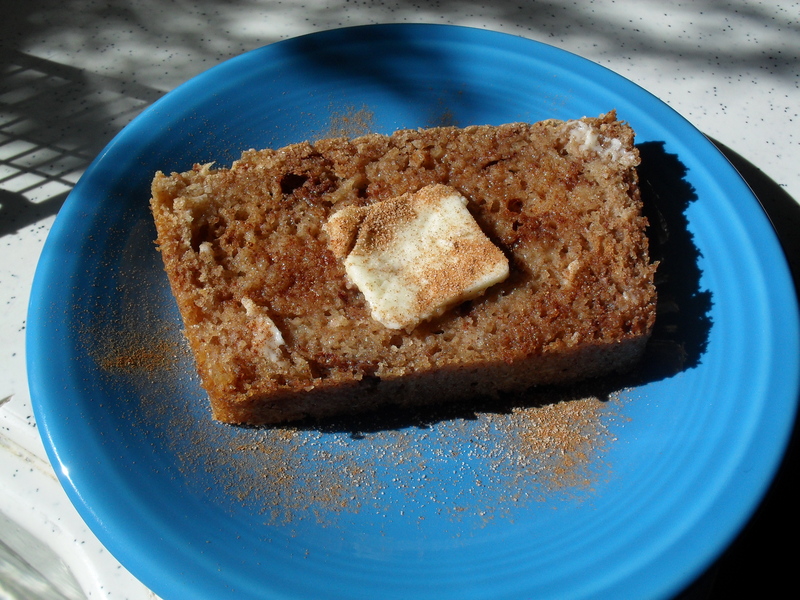 I wanted cinnamon bread – raised cinnamon bread. That was going to take hours of raising. Did I mention the temperature in my house? Not very yeast friendly. Granted, I could have set my oven to 100º and raised it in there, but I also didn’t want to wait the 4 hours to eat the bread. So I did the next best thing. 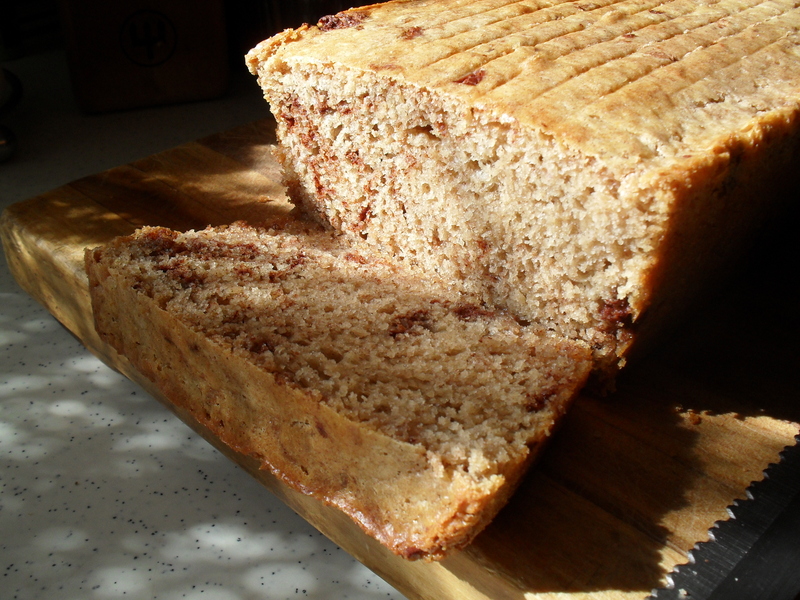 I made cinnamon quick bread. I found a recipe I liked the look of, but changed just a couple things. I didn’t have any whole wheat flour on hand so I used all white flour. I cut the sugar in half and I added some ground cardamom. I only added ¼ teaspoon. Next time I think I’ll add ½ teaspoon. This would be fabulous with toasted pecans or walnuts. Next time I think I’ll add some. I adapted it for high elevation as well. I have put those changes in parentheses. 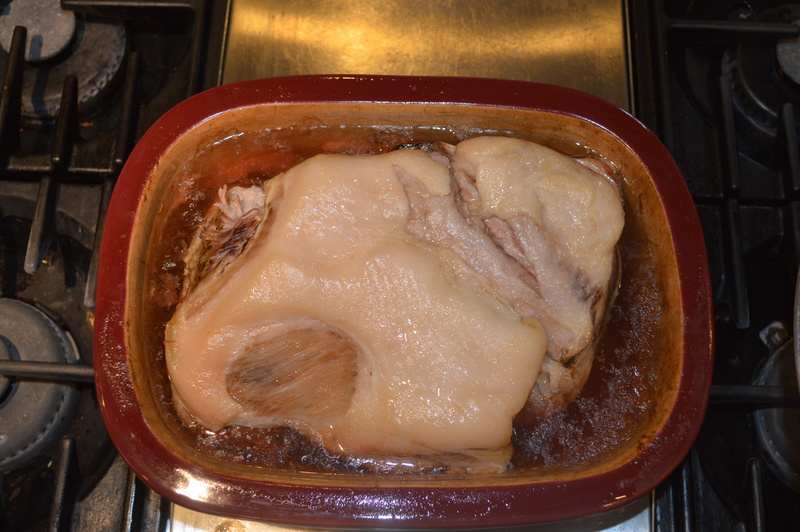 Preheat oven to 350º F. Grease a 9 X 5 inch loaf pan. In a small bowl cut the 4 T. butter into small squares (pea sized) and toss with 1 T. cinnamon. Keep in the refrigerator until ready to use. In a large bowl combine flour, sugar, baking powder, baking soda, cinnamon, ground cardamom and salt. In another bowl whisk eggs, buttermilk, melted butter and vanilla together. Add the wet ingredients to the dry ingredients and mix just until moistened. Gently fold in the cinnamon covered butter pieces. Pour into prepared loaf pan. Bake for 45 minutes. Let cool in pan on a rack for 10 minutes. Turn out and let cool until loaf will cut without crumbling. Serve with a little butter and some cinnamon/sugar sprinkled on top.